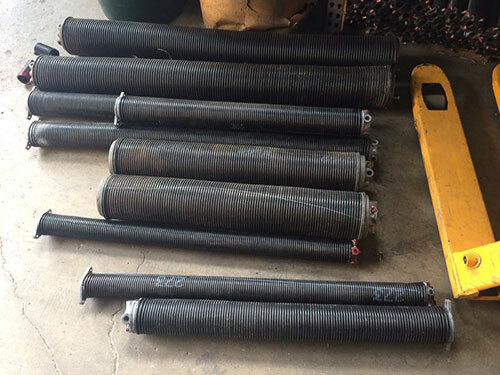 Many garage doors use the torsion spring as opposed to the extension spring to achieve an identical purpose. Both types of springs are used to help counter the weight of a door in the vertical position until it’s balanced. That’s why your door should never feel the need to move up or down on its own unless you give it a nudge. In the case of torsion springs,a torsion spring applies a rotational force known as torque in order to counter the weight of an overhead door and keep it balanced. But, what causes a torsion spring to randomly break or wear down over time? The average torsion spring is made to counter approximately 150lbs of weight through the rotational force of torque.These springs also generally last for approximately 10,000 cycles. That means every time your garage opens and closes your springs count down to their inevitable demise. This is because the molecular structure of your torsion spring is being forcefully pushed and pulled as the spring does work. While the spring is designed to be quite springy, this actually causes fatigue along the weaker sections of the spring. In the case of steel or iron, the spring may exceed its endurance limit or corrode leading to failure. Either way, you’ll need a garage door torsion spring replacement at some point. When that happens, be sure to check out our services to see how we can help.